right (the opposite of “left”). 右　belongs to the 会意文字 (かいいもじ, kaii moji, i.e. characters that are a combination of two or more pictographs, or characters which meaning was based on an abstract concept). 右 is a combination of two pictographs, though there are two major theories in regards to its etymology. First theory says that the top left part of the character 右 is reminiscent of a pictograph of the right hand, today’s　又 (ゆう/また, yū/mata; i.e. “again”, “furthermore”, “on the other hand”), which original meaning was “right hand”. As you can see on Figure 1, the Oracle bone script (甲骨文, kōkotsubun, i.e. “text on metal”) form of 又　is a pictograph of the right hand, depicting a forearm and three fingers. The 口 radical in 右 is a simplified pictograph of a vessel used for receiving blessings (called “sai”, さい). During a ceremony or a ritual, the vessel was held in the right hand. This theory is supported by the etymology of the character 左 (ひだり, left), where the top left part of the character is a pictograph of the left hand (I will explain this in details when talking about this kanji in my later posts), and 工, which is a pictograph of the rod or staff, used for the ritual. Further association with the meaning “right” and “left” is that the vessel and the rod used for the above mentioned ritual were swung by a shaman or a priest to the left and right, and up and down, in search of the divine, and receiving a blessing (benediction). The above would explain why the stroke order of the “hand” radical in both 右 and 左 is different (右 begins from the horizontal stroke, whereas 左 from the slanting stroke, written from the top right to the bottom left). In seal script （篆書, tensho) we usually write the long line depicting the arm and middle finger, and then add two more short lines (the remaining two fingers). 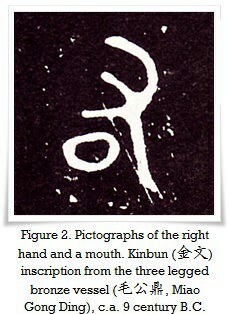 Another theory suggests that the character 右 consists of a pictograph of the right hand (又, mentioned above) and the mouth (today known as stand-alone kanji 口, くち), depicting a hand held just near the mouth for assistance, while eating (Figure 2). This theory would explain why the kanji 右 is displayed in dictionaries under a group of kanji which share the same radical: 口 (mouth). Further, the pictograph of the ritual vessel and the one of human mouth were virtually identical in the Oracle bone script (甲骨文, kōkotsubun), (Figure 3). Simply, various characters were added as the language evolved, whenever there was a need for distinguishing new words that would allow for more precise communication through writing. 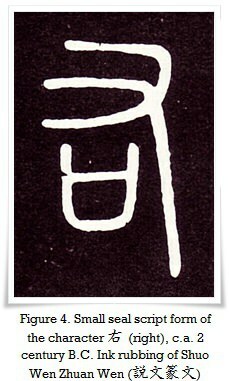 Adding the pictograph of a mouth or a ritual vessel to the Oracle bone script form of 又 (Figure 1) led to creating a new, more complex character: 右 (Figure 2). The validity of various etymology theories of the character 右 is further supported by the different shapes of 口 (compare Figure 2 with Figure 3 and Figure 4). The meaning of “assistance” and the “right hand” over a “mouth” leads to a meaning: “someone’s right hand” (i.e. aid, assistant), usually of a ruler. It is not without reason that the meaning of the kanji 佑 (ゆう, yū) is “to assist” or “to aid”. Its construction is based on combination of the person radical, a simplified form of 人 (ひと, hito), and 右. It could possibly indicate a person standing near the ruler, and whispering into his ear, while covering his mouth with right hand. Both theories have similar history and could go as far as the origin of Oracle bone script, i.e. the Shang dynasty (商朝, 1600 B.C. – 1046 B.C.). Scientists, however, are not able to prove beyond any doubt which of the above theories is the original etymology of the character 右, especially that the earliest forms of this character coexsisted simultaneously. Lastly, the Oracle bone script (甲骨文, kōkotsubun) and kinbun (金文, i.e. “text on metal”) forms of the vessel used for the rituals, and mouth, had similar to identical shape (Figure 3). There are many characters that may have multiple shapes and forms. When thinking of the etymology of the Chinese characters, one needs to take into consideration the huge area that the Chinese writing system was developed in, the distances between human dwellings, and time required to communicate any information. Last but not least, many wars and conflicts between clans often led to developing unique characters used only on given territory. It is not uncommon that some characters may have up to several forms and shapes. For instance, the kanji for a tiger (虎, とら, tora) has (at least) four forms, 邦 (くに, kuni, i.e. “country”, “(the) state”, “region”, etc.) has as many as eight of them. Those forms are further multiplied by various scripts (please jump to our main page, where I discuss five core calligraphy styles, in details). Kanji having two or three forms are not unusual. Consequently, one character may have few forms yet common etymology, or one form based on various etymology theories (just like kanji 右). Figure 2. Pictographs of the right hand over a mouth, an ancient form of the character 右 (right). Ink rubbing of kinbun (金文) inscription from the three legged bronze vessel (毛公鼎, Chinese: máo gōng dǐng), c.a. 9 century B.C. Figure 3. Oracle bone script (甲骨文) forms on a mouth and the ritual vessel, from c.a.1600 B.C. Figure 4. 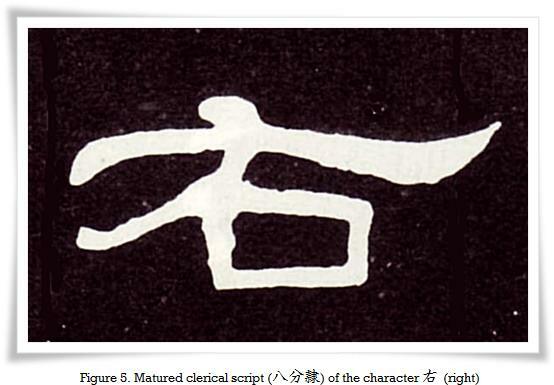 Small Seal script form of the character 右 (migi, right). Ink rubbing of 説文篆文 (Chinese: shuō wén zhuàn wén), c.a. 2nd century C.E. Figure 5. 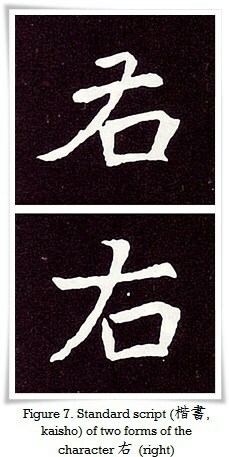 Matured Clerical script (八分隷, はっぷんれい, happun rei) of the character 右 (right). In rubbing from the stele 曹全碑 (Chinese: cáo quán bēi), 185 C.E. Figure 6. 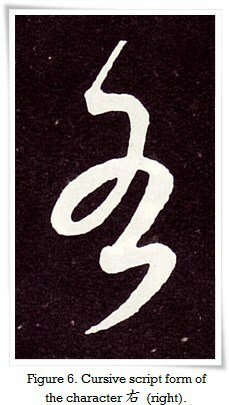 A Cursive script form of the character 右 (migi, i.e. right). Ink rubbing from the work of 饒介 (Ráo Jiè) from the Yuan dynasty (元朝, 1279 – 1368). Figure 7. Standard script (楷書, kaisho) of two forms of the character 右 (right) based on ink rubbings from two different stelae of the Northern Wei dynasty （東魏, 534 – 550). Note the remnant of the “3rd finger” (top character) emphasising the origin of the top left part of the character and its connection with the character 又 (right hand). Figure 8. Example of 行草書 (gyōsōsho, i.e. 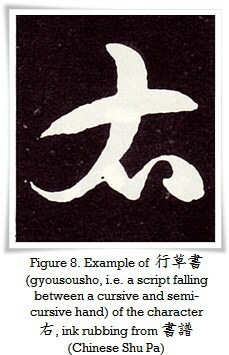 a script falling between a Cursive script and Semi-cursive script hand) of the character 右 (right), from the famous work 書譜 (Chinese: shū pǔ, i.e. The Treatise on Calligraphy) of 孫過庭 (Sūn Guòtíng, 648 – 703), a calligrapher of the Tang dynasty (唐朝, 618 – 907 C.E.). ← Far Eastern Calligraphy – is it written or drawn? Great article! I enjoyed the presentation of the various theories behind the origins of this apparently simply kanji and appreciate the historical figures that illustrated the points in your writing. …today’s　又 (ゆう/また, yuu/mata; i.e. “again”, “furthermore”, “on the other hand”), which original meaning was “right hand”. …under a group of kanji which share the same radical: 口 (mouth). …Lastly, the oracle bone script (甲骨文, koukotsubun) and kinbun (金文) forms –> what does Kinbun mean? My dictionary doesn’t have that word; instead, it has 金文字【きんもじ】	kinmoji, “gold or gilt letters”. (added “The”; removed “,” between “says” and “that; replaced “is a reminisence of” with “is reminiscent of”). (removed “the” between “on” and “Figure”). 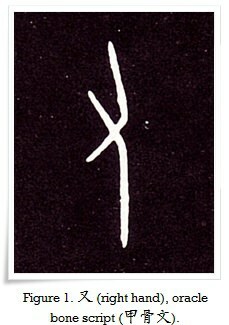 …which is a pictograph of the rod or a staff, used for the ritual. –> which is a pictograph of the rod or staff used the ritual. (removed “,” between “staff” and “used”). –>(Chines: Shuo1 Wen2 Zhuan4 Wen2), c.a. 2 century B.C..
(Chinese: Shuo1 Wen2 Zhuan4 Wen2), c.a. 2 century B.C. Many thanks, Zukumori, for reading the article really carefully. I agree that the best option would be to write conversions in a similar manner. I will edit those. Great input on the editing part. I will fix that, too. English being my 3rd language plays tricks on me sometimes, especially when I am tired. I can see that I will learn a lot only by correcting the text, so I really appreciate your time spent on editing it. Glad you enjoyed the read, more is coming! >>For instance, the kanji for a tiger (虎, とら) has (at least) seven forms, that are further multiplied by various scripts. Do you mean that the there exists at least seven different ideographs (Japanese Kanji/ Chinese character) for the word “tiger”, and that each of these seven ideographs may be further transformed into additional forms when rendered in various scripts? Or did you mean to say that the one ideograph for tiger (虎,【とら】,tora) can be rendered into at least seven different forms depending on which script is used? I wrote it of the top of my head and I had another kanji in mind, but yes, the character 虎 has more than one form (i.e. there is more than one ideograph for 虎). There are 4 of them, further multiply by scripts. If you would like I can scan them and send you an email with a .jpg file. Kanji having 2 or 3 different forms is not uncomon. 邦 has 8, and some look like completely diffferent character. I believe this is a “side effect” of multiple etymologies. Another issue is, that some characters may have different written (by hand) and 活字 forms (かつじ, katsuji, i.e. “printed font”). I will make a separate article about it with more examples. 金文 – well, our IT magician did not have a chance to link all the terms to our main site. Also, I have written quite extensive calligraphy terms dictionary, that should appear online in the near future.